(Natural News) A burger isn’t complete without a plate of salty, greasy French fries. But did you know that fries contain a carcinogen called acrylamide? If you just can’t get enough of French fries, it’s time to read up on the four health risks of eating this popular fast food. French fries are full of fats that can make you gain unwanted weight. A single serving of French fries has 24 g of fat, but your daily diet shouldn’t include more than 65 g.
According to a study conducted by the Diabetes and Obesity Center of Excellence at the University of Washington, a diet high in fats can damage the brain’s nerve cells that control body weight. French fries also contain high amounts of saturated and trans fats. The American Heart Association warns that these kinds of fat can increase blood cholesterol, which can then increase your risk of heart disease, stroke, and Type 2 diabetes. The excess salt (sodium chloride) in fries can also cause water retention in your body, which results in weight gain. French fries are seasoned with a lot of salt. Anything salty consumed regularly may increase your blood pressure, which can cause heart and kidney ailments and even a stroke. According to the National Academy of Medicine (NAM), formerly called the Institute of Medicine, you should only consume 1,500 to 2,000 mg (or half a teaspoon) of salt daily. However, the average American consumes around two teaspoons of salt per day. A serving of French fries has at least one-third of the recommended daily intake (RDA) of salt or more than 600 mg.
French fries are full of carbohydrates and “bad” fats. A serving of fries has 63 g of carbohydrates. When consumed in moderation, carbohydrates are beneficial and they give your body energy. Fiber is also a type of carb that promotes proper digestion and restricts the excess release of insulin. However, the potatoes used to make French fries are peeled, which strips them of fiber. 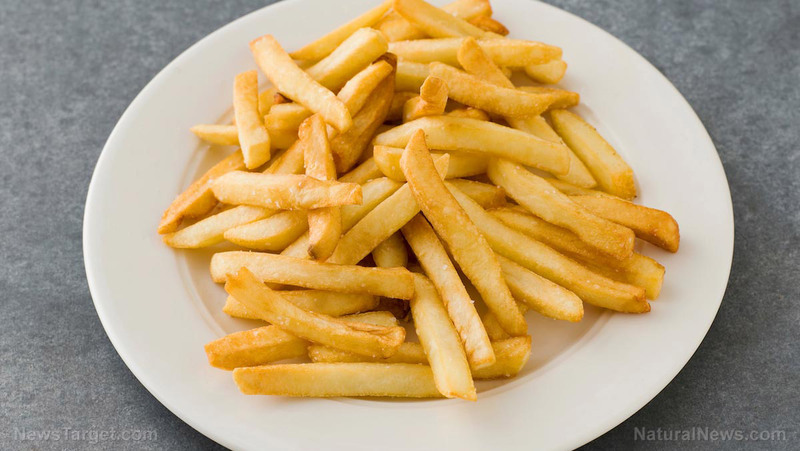 Eating a lot of fries also increases your salt and starch intake along with fats from the oil used to fry them. All these factors combined can increase your risk of developing health problems like cancer, heart disease, obesity, and Type 2 diabetes. Pregnant women should avoid consuming French fries altogether because it contains acrylamide, a carcinogenic and neurotoxic agent. Acrylamide is found in foods fried at higher temperatures of more than 365 F. Fetuses and newborns are more susceptible to the effects of acrylamide since their blood-brain barrier still isn’t fully developed. If you want to lower your risk of cancer, heart disease, obesity, and Type 2 diabetes, limit your consumption of French fries. You can try making healthier homemade fries by baking potatoes in olive oil instead. Try these healthy alternatives to French fries the next time you feel like munching on a savory snack. Crispy green beans – Fresh, crispy green beans are just as crunchy as fries. Toss the green beans in some olive oil, then season with garlic powder, salt, and pepper. Roast the green beans in the oven until they start to turn brown, then take them out and sprinkle them with grated Parmesan before serving. Kale chips – Kale chips are rich in vitamins and minerals. Remove the thick stalks from the kale, then chop the leaves into small chip-like pieces. Drizzle them with olive oil, pepper, and salt, then bake until crisp. Parmesan zucchini fries – Slice zucchini lengthwise to resemble French fries, dip them in beaten eggs, then roll them in a Parmesan mixture. Bake the zucchini fries for 20 to 25 minutes, then season lightly with Italian spices before serving. Roasted parsnip fries – To make roasted parsnip fries, toss chopped parsnips in olive oil, pepper, and salt. Roast the parsnips until they are golden brown and crispy. For added flavor, serve the roasted parsnip fries with a curry dipping sauce. Sweet potato fries – Cut sweet potatoes lengthwise to resemble fries. Drizzle olive oil on the sweet potato fries, then bake them in the oven to reduce their trans-fat content. Sweet potatoes are full of fiber and they also contain heart-healthy vitamin A.